Fernando Alonso has made clear that he has not closed the door on returning to F1 in the future. The two-time world champion is bowing out of the sport after this weekend's Abu Dhabi GP after 17 seasons to concentrate on racing in other categories, but has not called the exit his definitive F1 'retirement'. And while he does not currently have any plans to make a comeback in little over 12 months' time, Alonso admits that his feelings could change mid-way through next year as he watches a season on the sidelines for the first time since 2002. "Right now it's difficult to think about coming back, but the door is not closed," said the 37-year-old. "I don't know how I will feel next year. I have been doing this for my whole life so maybe next year by April or May I'm desperate on the sofa so maybe I find a way somehow to come back. VOTE: Who has been the driver of 2018? "But it's not the initial idea. So it's more about myself: if I come back it's not for any particular reason or deadline or something that has to happen. It's going to be more how I feel in the middle of next year." In contrast to a 21-race F1 season around the globe, Alonso's 2019 hitherto racing schedule is relatively quiet. He has so far committed to the Indy 500 in May, when he will attempt to complete the triple crown, and the final three rounds of the World Endurance Championship super-season when he and his Toyota team-mates will bid for the drivers' title. Alonso later added to Sky F1: "Right now, it's my intention that this is my last race. But by next year, maybe, I will feel empty without Formula 1 and I will find a way to come back in the future." 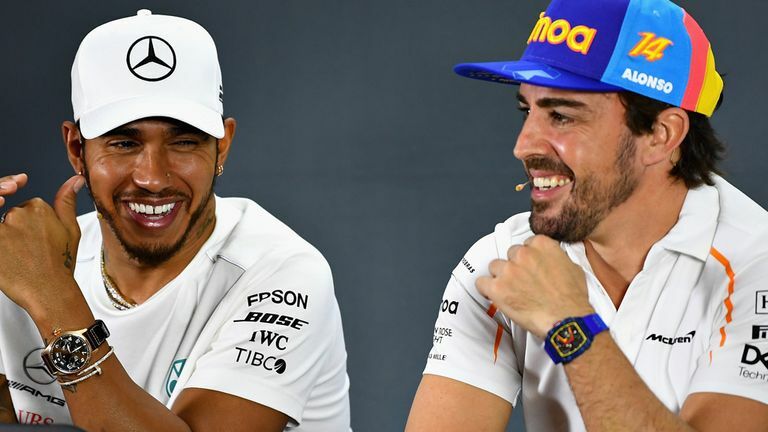 2018's season finale is widely being viewed as Alonso's F1 swansong, with tributes being paid to the McLaren driver from around the paddock - including world champion Lewis Hamilton, a former team-mate and title adversary. "We've had good times and bad times," said Hamilton. "He was obviously here before I was and achieved incredible things before I got here and also partly while I was here. It's been a privilege to be in an era when he was racing. "The sport will miss him." 2pm: Welcome to the Weekend LIVE! VOTE: Who has been driver of 2018?